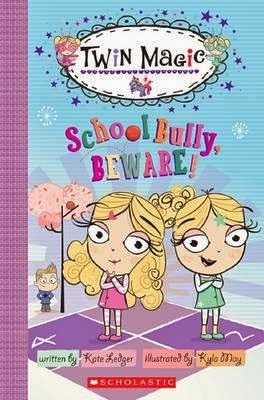 Buzz Words: Twin Magic: School Bully, Beware! Twin Magic: School Bully, Beware! Lottie and Mia are twins but they are not the same in every way. Mia is an early riser while Lottie likes to sleep in; Mia is tidy while Lottie's room is always in a mess. But one thing they have in common is their best friend Toby who they walk to school with. The bright colourful illustrations are very attractive for younger girls, those just beginning to read, and the appeal of magic, unicorns and twins are fairly universal in this young female age range. The themes of friends, teamwork and seeing beyond surface appearances are good issues to explore too. School Bully, Beware! is the second in the new Twin Magic series for girls between six and eight (after Lost Tooth Rescue) and is a good start for stand-alone reading.